Wondering where to stay in the "Blue City" of Jodhpur? There's a great range of accommodations to suit all budgets. Most of the old "haveli" hotels and guesthouses are located in the heart of the action, in the clock tower market area at the front of the fort. It's a popular tourist district with plenty of restaurants and shops, plus an awesome view of the fort. However, do be aware that it's also very congested. The lanes are narrow and you may be required to walk a short distance to your hotel. If you'd prefer to stay in the quieter and non-touristy traditional old blue part of Jodhpur, head to the Navchokiya neighborhood behind the fort. Alternatively, there are other more upmarket hotels on the outskirts of Jodhpur. Here are 14 top hotels and guesthouses in Jodhpur for all budgets, from luxury to backpacker. The most imposing palace hotel in India, Umaid Bhawan is a mammoth sandstone and marble structure that was built over a period of 15 years, from 1929 to 1943. Its owners, the Jodhpur royal family, still live in a portion of it. (Their website claims it's the world's sixth largest private residence). The remaining parts have been converted into a luxury Taj hotel and a museum showcasing the 20th century history of the royal family. The palace has more than 340 rooms, with 64 of them being used as guest quarters in the opulent hotel wing. Guests have access to many facilities such as swimming pools, libraries, recreation rooms, and ballroom. The hotel offers guests guided heritage walks around the palace. It also has a wellness spa, two restaurants, and a lounge bar. You'll be treated like royalty -- if you can afford it! Rates start from 24,000 rupees per night for a double room during the low season (April and May), and jump to 53,500 rupees per night upwards at the start of the tourist season in October. Not far from Umaid Bhawan, Ajit Bhawan was built in 1927 for the Maharaja of Jodhpur's younger brother. The property is still inhabited by the royal family, who have developed a sprawling "heritage hotel" in the expansive grounds behind the actual palace. The hotel has been set up with the aim of providing guests with an extravagant Rajasthani experience in a village-style setting. The rather unusual accommodations mostly consist of thatched ethnic cottages and luxury tents. There are also theme-based "Ajit" suites, and massive presidential suites (with two bedrooms, three bathrooms, living room, study, and private courtyard). During the tourist season, from October to April, traditionally-dressed local women cook Rajasthani cuisine on earthen stoves in the hotel's open-air restaurant. The quirky bar has palanquins on its ceiling, and prides itself on its martinis and fine stock of alcohol. The hotel also has a swimming pool, spa and gym, and a vintage car collection that can be taken out for spin (for a hefty fee)! Rates start from around 15,000 rupees per night for a double in the tourist season, dropping to 4,500 rupees per night in the summer. RAAS, Jodhpur's first boutique hotel, opened in 2010. This magnificent heritage property is a seamless fusion of modern and ancient, and it is situated right in the historic old walled part of the city below the fort. The property comprises four original buildings plus three new ones made out of red sandstone using traditional techniques. Its renovation inspired the ambitious JDH Urban Regeneration Project, which aims to re-brand the walled city through real estate development and architectural restoration (the Step Well Square precinct is an example of the work). The hotel has 39 rooms and suites, two restaurants, wellness spa, swimming pool, and gem shop. Its restaurants, one of which is outdoors and has captivating fort views, focus on organic ingredients from the chef's garden and hand-ground spices. Rates start from around 13,000 rupees per night for a double, breakfast included. Ratan Vilas is a heritage mansion built in 1920 by Maharaj Ratan Singhji of Raoti. His descendants still live in the property, which they've converted to a superbly-managed heritage hotel. A new wing was recently added but it doesn't lack any of the charm of the rest of the place. Old family portraits fill the drawing room and you may even encounter the owner, who will fill you in on his fascinating family history. (Maharaj Ratan Singhji of Raoti was apparently one of the best horsemen and polo players of his time). The property is about 15 minutes drive from the fort. Facilities include a swimming pool and garden restaurant where you can dine under the stars. There are 15 rooms. Expect to pay around 5,000 rupees per night upwards for a double, including breakfast. The Kothi Heritage is a wonderfully intimate hotel that has all the warmth of a homestay. The property was built in 1888 by Bachraj Ji Singhvi, who served as Commander in Chief to the Maharaja of Jodhpur, and was used as the family's summer house. His two great grandsons completely revamped it and opened it as a heritage hotel in 2009. They are very involved in the hotel's operations, and are always around to personally welcome and interact with guests. Indeed, the very high standard of service and attention to detail are things guests appreciate the most. The hotel is located in a residential area 15 minutes southwest of the fort and only has seven guest rooms. They're all beautifully furnished with antiques. There's also a rooftop restaurant on the premises that serves authentic Rajasthani dishes. Rates are very reasonable and start from around 2,500 rupees per night for a double, including breakfast. Can't afford RAAS but want to stay in a glorious heritage property in the old city? Pal Haveli is ideal. The property is in the same area as RAAS, close to the clock tower, and was built by a noble family from nearby Pal in 1847. It has been receiving distinguished guests from around the world for more than a century. The family still lives at the property and they've done it up beautifully. The 21 elegant guest rooms have period furniture and family photos in them. There's also a small museum filled with weaponry, costumes, palanquins and other regal memorabilia. The hotel's rooftop restaurant, Indique, is a popular attraction because of its exceptional fort views. Rates start from around 6,000 rupees per night for a double room. A cheaper option is the simpler Haveli Inn Pal guesthouse, located in a separate wing of the property. Formerly Shahi Guest House, this 350 year-old family-owned haveli recently received a makeover. The property sits just south of the fort, in the old city, not far from the blue houses in Navchokiya. It has quite a fascinating history, as it was developed from women's quarters where they met in purdah (this part is now the Queen's Palace Heritage Suite). The hotel has retained many original features, including stone lattice work, balconies, narrow walkways, and central courtyard. There's a rooftop restaurant with panoramic fort views and just six rooms for guests. Do note that the owners reside in the building, making it more like a homestay than a hotel. Expect to pay 3,000 rupees per night upwards for a double room. The Arch Boutique Homestay opened in December 2017, immediately impressing guests with its decor and kind service. The property has a fabulous location in the old city, right at Step Well Square and only 100 meters from RAAS. You can even see the step well from its rooftop and watch people swimming. The heritage building has been tastefully refurbished, keeping its rustic elements intact while adding modern guest comforts such as air-conditioning, and soft mattresses and pillows. There are six guest rooms, all unique and different. Some have balconies. The property also has a restaurant that serves delicious vegetarian cuisine, including traditional Rajasthani dishes that are hard to find elsewhere. Expect to pay 3,000 rupees per night upwards for a double room. A characterful 472 year-old haveli, Juna Mahal was once the home of a Brahmin family who served as priests in the royal family's temples. The property is in the same area as Shahi Heritage, albeit a bit further out. Its five stylish guest rooms are all named after Hindu gods, and have air-conditioning and balconies. There's also a vegetarian rooftop restaurant with fort views. Although the Juna Mahal describes itself as a homestay, and the owners do live on the premises, it's more like guesthouse. The day-to-day-running of the property has been assigned to an affable manager and there's limited interaction with the owners. Room rates range from 2,000-3,550 rupees per night. Interestingly, the owners recently opened a new boutique homestay, called Raj Mandir, at the back of the fort in Navchokiya. 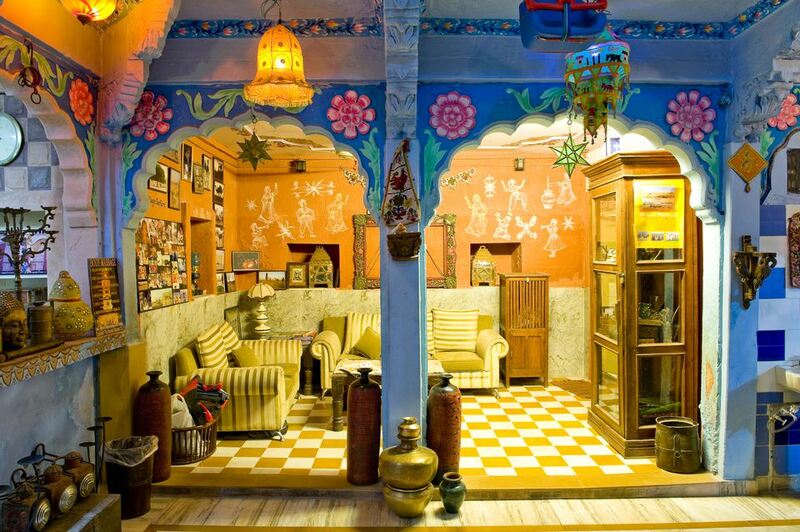 Singhvi's Haveli is over 500 years old and will take you on a trip down memory lane. The Maharaja of Jodhpur gave the property to the present owners' great grandfather (Sri Akheraj Sa Singhvi), who was a Commander in Chief of the Maharaja's army, in 1778. It's been carefully restored, and the 13 guest rooms are adorned with family portraits, traditional decor, and other nostalgia. The suites are particularly elaborate and atmospheric. The gorgeous Maharani suite is really worth splurging on! The property is situated at the back of the fort (about 20 minutes walk from the clock tower) in the Navchokiya area, which is the bluest part of Jodhpur. Rates start from around 1,000 rupees per night. Expect to pay 3,800 rupees per night for the suite. This very popular heritage guesthouse is only a few hundred meters from the fort and a few minutes walk from Step Well Square in the old city. The property was recently renovated but still has ample old-world charm including high ceilings, arched windows, stained glass, vintage photographs of past kings, and an outdoor courtyard with fountain. It's a friendly place, with hosts that can't do enough for their guests. There are seven rooms, and a rooftop restaurant that serves cold beer and yummy food (the home-style Indian thali is recommended). Rates start from 1,500 rupees per night. Not far from King's Retreat, Geeta Mahal is a cute little budget guesthouse with four air-conditioned rooms. The rooms are basic but clean and cozy. A couple of them have a view of the fort, and that's what makes this property really stand out. Its rooftop restaurant also provides a spectacular fort view (and chilled beer). Plus, there are books to read and a guitar to play. The congenial host, with a great sense of humor, is a real bonus! As with most heritage buildings in the area, do be aware that you'll need to climb the stairs as there's no lift. Rates start from 1,300 rupees per night for a double room. Vibrant and soulful, Yogi Guesthouse occupies a 500 year-old haveli right opposite Geeta Mahal. It's an iconic blue building tucked away behind a gate and set around a leafy courtyard, making it much quieter than many other heritage properties in the area. The guesthouse provides a relaxed experience for travelers, with many inviting common spaces to hang out in. The food served in the rooftop restaurant is hit and miss but the fort view, ambiance, and inexpensive alcohol compensate for it. There's wide range of accommodations, from beds in a dorm room to spacious heritage rooms that have balconies with fort views. Expect to pay 399 rupees for a dorm bed, increasing to 2,400 rupees per night for a heritage room. You can't get any closer to the fort than this family-run guesthouse. It literally sits right at the bottom of it! The property opened in early 2017, so everything inside it is still sparkly and fresh. It features colorful murals on the walls and a rooftop restaurant that serves home-style Indian food. The hospitality is outstanding. And, needless to say, the fort view is epic! The accommodations consist of dorms and private rooms, some with air-conditioning. Rates start from 400 rupees per night for a dorm bed, and go up to 1,100 rupees per night for a private double room.